Will BJP govt condone discharge of untreated effluents from Gujarat? Will the Union ministry of forests and environment condone discharge of untreated effluents from Gujarat’s industrial region? 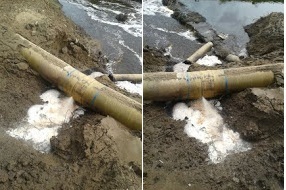 For the past fortnight, the pipeline of the Final Effluent Treatment Plant (FETP) of the Narmada Clean Tech Ltd (NCTL) of Ankleshwar is again leaking with its breakage at the Ankleshwar-Amboli road next to Central Industrial Security Force (CISF) camp. The consistent violation of the prescribed norms of the Gujarat Pollution Control Board (GPCB) by the FETP operated by NCTL since its inception is publicly well known. The Ministry of Environment and Forests (MoEF) should clarify which law of the land sanctions the discharge of effluents that do not meet the prescribed norms of the GPCB. Alternatively, it would appear, by allowing the FETP to operate despite inability to perform within legal norms, the NCTL’s continued violation of the environment laws of the nation is being condoned. The violation of environmental laws is supported by the investigation results of CPCB from 2007 to 2014, and even of NCTL results from 2013 to 2014 (click APPENDIX for investigation results). The NCTL, formerly known as Bharuch Eco Aqua Infrastructure Ltd. (BEAIL), earlier a private company, is now a subsidiary company of Gujarat Industrial Development Corporation (GIDC). The GIDC is a statutory corporation and 100 per cent owned by the Government of Gujarat. The NCTL is also a joint venture of member industries of Ankleshwar, Jhagadia and Panoli industrial estates. The NCTL claims that the objective is to receive treated industrial effluent from Ankleshwar, Jhagadia and Panoli industrial estates, common effluent treatment plants (CETPs) and to “treat” it at the Final Effluent Treatment Plant (FETP) up to prescribed norms of the GPCB, and then to convey it through 52.76 km pipeline into the sea. The industries located in Ankleshwar, Panoli and Jhagadia GIDC estates treat their effluent in their Common Effluent Treatment Plant (CETP), and then, after giving further treatment at the FETP at Ankleshwar, discharge the effluent into the sea. The FETP, from its inception till date, does not work as per the prescribed norms set by the GPCB. In part due to the FETP’s inability to treat effluent, in July 7, 2007, the GPCB, on the directions from the CPCB, imposed a moratorium on the industrial areas of Ankleshwar, Panoli and Jhagadia. The moratorium is in force even today, since there has been no substantial improvement in the pollution levels even after the implementation of the so-called ‘action plans’ prepared by these estates. Shockingly and surprisingly, the same plant’s disposal pipeline project was inaugurated by the then Chief Minister of Gujarat Narendra Modi, now Prime Minister of India, on January 25, 2007. By inaugurating this plant, Modi sent out a message to the industries and new investors that compliance with environment laws in the state was not matter of a concern. Why did Modi inaugurate the FETP pipeline project despite its non-compliance with the GPCB norms? We will never know, because the records were destroyed. It is difficult to believe that a so-called responsible and publicly accountable office such as the CMO, especially with its emphasis on “transparent and effective public governance”, would destroy official records of public importance, even while Modi continue to be the chief minister in the consecutive term. With its emphasis on ‘information technology’ in governance, the soft copies of the correspondence should be present in the some official data bank, or one would assume that the CMO deliberately withholds or denies information that should be in public realm and the then Chief Minister’s public accountability stands questioned. Why does the CMO want to hide this information? What is the state policy on destruction of records? Under what rules or laws such critical documents have been, as officially claimed, destroyed? The pipeline project of the FETP of Ankleshwar was built with tax payers’ money. Out of the total project cost of Rs 131.43 crore, the industries paid only Rs 21.75 crore (about 17 per cent); the rest of the amount (Rs 109 crore) was borne by the Government of India, the Gujarat government and the GIDC – all of which ultimately draw from public money. It is a familiar story: The profits are distributed privately, but the institutional costs and environmental burden are borne by general public. Can we find a better example of privatization of profits and socialization of costs, burdens and hazards? Why does the government charge the cost to tax payers when industries pollute? The pipeline, 52.97 km which carries the effluent from the NCTL to the sea for discharge regularly, gets broken, and that lead to illegal discharge into Amla Khadi (which at the end meets the Narmada river) as also into the farms lands of the farmers of various villagers. A letter dated January 7, 2011 was sent to the then Chief Minister and concerned state authorities by giving aRepeated complains of the farmers are deliberately ignored. 1. Stop the effluent discharge from the Final Effluent Treatment Plant (FETP) of Narmada Clean Tech Ltd (NCTL) as it consistently violates the prescribed GPCB norms since its inception; the pipeline leaks effluents due to breakage at Ankleshwar – Amboli road next to CISF camp. 2. File FIR and take all the exemplary legal action against the defaulters. 3. Declare under which law of the land the illegal effluent discharge from the NCTL is allowed when it does not meet the prescribed norms of GPCB.